Kate Atkinson has spent a bit of time recently in the Second World War. While researching her previous book A God in Ruins she came across the story of Jack King, a bank clerk who helped in the early days of the war to entrap Nazi sympathisers in Britain. This true story became the inspiration for her latest novel, Transcription, which has the feel of a spy novel although one that is on occasion slyly winking at its audience. Transcription opens in 1981, ageing Juliet Armstrong is knocked over while crossing the road. Nesting backwards, the accident sends her memory back to 1950 when she worked at the BBC and then, remembering how she caught site of someone she worked with during the war, back further to 1940. In 1940, Juliette was recruited by MI5 to help them with a sting operation. Godfrey Toby has been cultivating local fascists and Nazi sympathisers. Juliet’s job is to sit in the flat next door and transcribe the conversations between Toby and his marks. Later she is also recruited to go undercover and infiltrate a circle of sympathisers. Neither job ends quite the way Juliet expects and she is concerned that the repercussions have followed her into her post-war life. It is also during this later time that she starts to make sense of some of the events that she was too naïve or inexperienced to understand at the time. Transcription is a very literary spy novel, partially because of Juliet’s fondness for literature. She is often comparing people and situations to Shakespeare or tossing off the odd quote (sometime parenthetically) even if this goes over her colleagues heads. But there are plenty of other references to classics including Dickens and Bronte. But that does not mean Atkinson misses on any of the spy tropes. There is mistaken identity, dead drops, a close shave, an unwilling accomplice, and a cover up. Underneath it all there are secrets that only emerge slowly from the fog of the narrative and which throw the whole story into relief. There had been other identities too… And then there was Juliet Armstrong, of course, who some days seemed like the most fictional of them all, despite being the ‘real’ Juliet. But then what constituted real? Wasn’t everything, even this life itself just a game of deception? 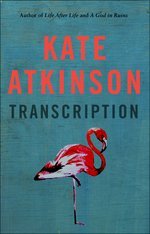 In Transcription, Kate Atkinson brings what readers have come to expect in what is for her, if you subscribe to labels, a new genre – a deep knowledge of her subject matter, fondness for her characters, plenty of literary allusion, witty sensibility and a rattling yarn.